Come, sit with me and talk about the sea and the land. Tell me how something so clear can be so deep. Break these shells for me and let the flood run. Together, they are somewhere between earth and saltwater. Let’s drink the broth and take the oysters with it. This is one of the most delicious and simple ways I know to enjoy oysters. Think over your chicken stock, pause and taste from time to time. It should be deep-flavoured and clear. low simmer. Reduce the heat to low and simmer gently, uncovered, for 2–3 hours, topping up the water during cooking, if necessary. Pass the cooked stock through a very fine sieve into a clean bowl or container, allow to cool, then cover and refrigerate. put 3 oysters into the bottom of each plate. Pour the oyster liquor into the chicken stock. Stir, then bring the stock back up to simmering point. 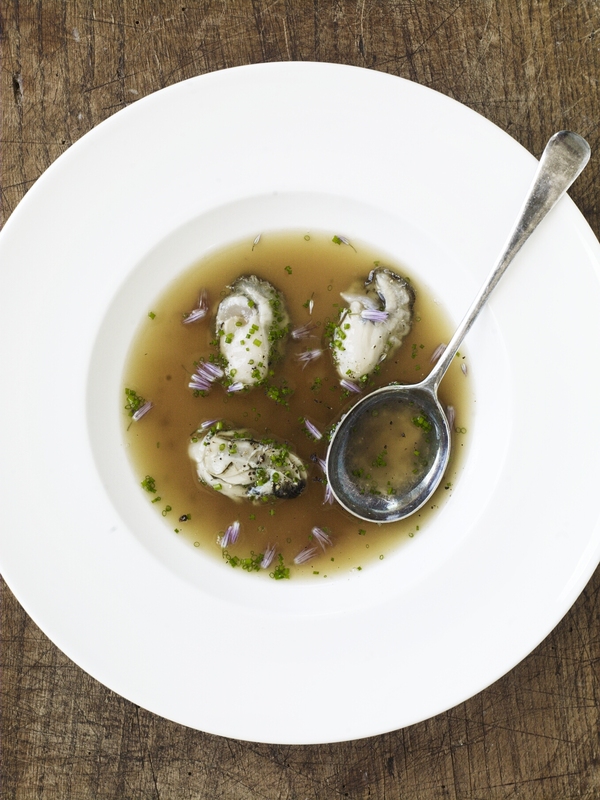 Remove the stock from the heat and immediately pour it over the oysters to lightly poach them in the plate. Scatter over the chives, and any flowers, if available. Season with salt and pepper, then serve straight away.